Lisa's Kitchen Sink: Where do the designs come from? I have had se veral conversations lately with students regarding a general lack of design classes. It brings to mind many questions. Why do I choose those beads: textures, colors and material. Why do I use fine silver wire, why do I weave or wrap or coil, is this a necklace or earring or bracelet and why exactly choose one over the other? There are so many details that go into a single project that a full description of why would take you through years of boring life details and preferences and a few professional decisions. On a particular day of procrastination I decided to organize all photos on my computer. In the process I found a sketch of an idea, the purpose of this post. For many years I have taught evening classes for Hooked On Wire . Each year I try to come up with a new project for the retreat and each year I wait till the last minute. One particular year I was very bad and found myself sketching the day my idea was due. I sent it in for approval. Man, these ladies have faith as it was accepted. Wire: cause I like a little friction in my life. Silver metal: cause it is cheaper than 14K while gold and takes on a great patina. Sterling warps: because it is a hard enough metal that I know they will hold up to casual touchy, touchy that we all do with our earrings. 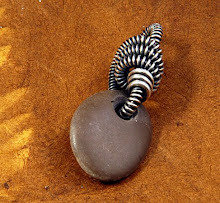 Spirals and curls to end: because it is the easiest way to decoratively end a wire. Blackened patina: because it shows the detail of frustration achieved while trying to weave wire. 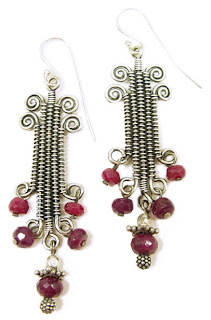 Rubies: because I managed a bead store for 10 years and know my way around a good bead. The title: Ionic Column Earrings because Emily Miller suggested it and she is a rock star when it comes to conjuring up a good name. Every piece of jewelry that we make is a reflection of everything we have ever made, the materials that are available to us, the inspiration that drove us to make something in the first place and many other indeterminable factors that often elude us. 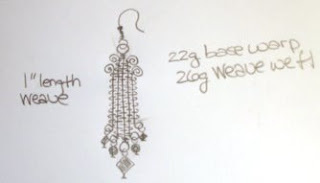 Above is a design that for myself is rather straightforward, draw it out, work it up, add some beads. My best pieces allude me for many months, even year, and seem to fall out of my hands with surprise. Why do you do what you do and what influences drive you?
! design story ! highlights benefits of procrastination pressure .. Like the results!